In November of 2018, I had the pleasure of being a guest on a podcast produced by a company called Kazsource. We discussed what led me to leave school psychology and open my private practice, the meaning of 504s, IEPs, and much more. As you listen to the podcast, feel free to follow along with the transcript below, skip to the parts that interest you using the outline, or read the abridged transcript here! The abridged version focuses on key terms and concepts that parents seeking education help for their children and adults struggling to keep up with work or school will find especially useful. If you have questions or would like to schedule a phone consultation, please contact me! 09:53 Is an outside psychologist well received by the schools? 11:04 How do families find you? 13:59 Do schools have a responsibility to tell families about you? 15:07 When will a school do an assessment? Eric: Welcome to the podcast Entrepreneur Perspectives building and protecting your business one podcast at a time, a Kazsource family production. In this episode, we discuss coffee, helping children and educational psychology. Our guest today is Laurie Adachi, licensed educational psychologist. Laurie is located in Santa Clarita, California where she runs her private practice. She has over 30 years of experience and opened her practice in 1996. Laurie works with children and adults with all types of learning issues, including language disorders, ADHD, severe emotional disturbances, physical handicaps, Autism Spectrum Disorders and other developmental delays. Her knowledge of her craft was on full display in our chat. Her actions prove she has a heart of gold and truly loves what she does. And with so much to talk about, let’s get right into this episode and welcome Laurie Adachi. Laurie, you are a big coffee lover. What is your favorite type of coffee? Laurie: Probably, would be anything with espresso. I would say a nice latte or a cappuccino, but a cappuccino has to be in an actual ceramic cup. It can’t be in a paper cup, so if I am stuck to a to-go, it’s going to be a latte. Eric: Very particular and I think that’s important. When you like something, you understand what you like and how you like it. You can’t deviate from that plan. When did you get so into coffee? Laurie: Oh goodness. I would say in my early adult years I wasn’t a coffee drinker at all. It was probably when I started working in schools that it became a mainstay in order to just keep going and going and going. Eric: That’s perfect. I remember we had…I didn’t drink coffee. And I have three kids now and my oldest is my son. He was born and I think that was the moment I was like I need coffee, now. And I needed it. You know. So there is always a reason where someone gets into it. You hear a lot about in the wine industry or beer industry, or types of food. People are very particular about it. I am always fascinated because they have such genuine interest and when we met, and it’s been a while now, I remember one of the first things we talked about was coffee. And how coffee is really important. It became important to you in school so you can keep going like you said. You enjoy that cup of coffee and I think you talked about enjoying a cup when you’re chatting with a friend or client. Or you’re just reading a book on a nice day and looking out the window and having a nice cup of coffee next you. When I say all of those things, I know you talked about it a lot but coffee is important to you, right? I mean it’s more than just drinking a cup. You have a specific way you want to take your coffee. It’s become a part of who you are. Laurie: Absolutely, I guess it has replaced comfort food. It’s now my comfort coffee. But even to the point where I have a coffee set up in my office. First thing when you hit the door, it looks inviting. It’s just a kind of way to welcome people in to my office. I have it in my house also, so I welcome people in also. 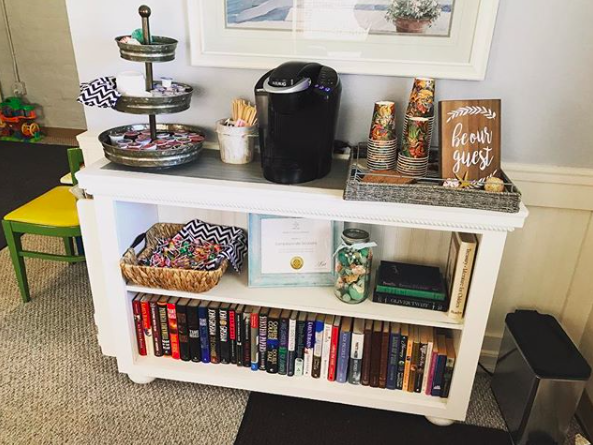 And it’s funny because in my first office, gosh more than 20 years ago, we had a little coffee nook with just flavored coffees going in a regular pot just to kind of fill the air and give a sense of comfort. That was way before the whole excitement of setting up your little coffee nooks. Yeah, it’s definitely been a mainstay. Eric: It’s important. You can go into a dentist office now and they will have video games for the kids. Because what kids want to go to the dentist office? And they might have coffee, whatever it is that’s inviting because people are coming to you and they are opening up a little bit. It’s not to get people to say something they don’t want to. You’re trying to understand what they’re thinking and what’s going through their mind and how you can help them out and having something that’s inviting like coffee and I also think it’s important because if I like and you like coffee we can talk about coffee. And now we can talk about things that maybe I really need help with. So I think it makes a lot of sense. We see it in your social media pages. You have pictures of you drinking coffee or pictures of you in the office drinking coffee or the nook that you talk about. They have the ability to come to your office and have a cup of coffee with you. Laurie: Or a new cup that I’ve bought. I love to share those too. Eric: So do you, let’s just stay on coffee for a second. Are there places in Santa Clarita that are your favorite coffee spots? Do you like to brew your own coffee at home? How do you look at that? Laurie: I really do enjoy a good Starbucks latte, especially around the holiday times. I love the holiday flavors, although I can’t drink them all the time or I would be gaining all kinds of weight. My absolute favorite in any town is to seek out the little mom and pop type coffee shop and just try to soak in something that’s about the locals. So that’s always what I look for. And here in Newhall we have a place called Honu Coffee. That’s just in walking distance where I can sit down and meet someone. Eric: I think it’s important, whether it’s coffee, gardening or sports, it’s important to have those interests. It’s an enjoyable walk to get my cup of coffee. I think it’s important that if I’m seeing you or my kids are, that you’re in a good place, that you are ripe for the conversation, right? Eric: So you were in school and now you have your own business. Tell us about your journey starting your own business and wanting to start your business in educational psychology. Laurie: I worked in schools as a school psychologist. I started off with the severely handicapped population and then moved into general education working with the more mild to moderate needs of students. And I think I did that for about nine years and I just had a hard time balancing what is right for the student and the student’s family and what is good for the school. And my training and my orientation has always been this is about the kid and I needed to do what was right for them. So it was hard for me to try and balance that line. So I felt the tug probably about mid-way through those nine years to do more for the individual and it started off just part time and it grew. And then I just decided I had to take that leap of faith and go into a private practice of working for students and their families and so now I work on the opposite side of the table from the school people. So I come from a place of being very cooperative and wanting to make things work but I can give the parents all of the advice that I had to be careful when I was actually working in the school. Eric: So you advocate for the child, for the family. But you’ve been on both sides of it so you have an understanding of what it’s like to be on the school side but you understand the family that is trying to get their child help. It’s all about the kid, I couldn’t agree more. There are just so many politics that goes into the school districts and people that they have to answer to. But they need an advocate like you, because they are being thrown in so many different directions. And it’s confusing and families I think have a hard time keeping up as to what do I do. I don’t know, I’m not a professional. I don’t work in educational psychology. You studied for years to get where you are today. They need someone like you, but it’s often not known that they need someone like you until it’s later on in the game, right? Laurie: Right. I have a sister who is developmentally delayed and so early on I saw my mom going through the system and trying to deal with that. And then it came later on when she would try to read a report about my sister’s functioning, it was hard for her to interpret or understand or get through it without crying and now I can try and gear things to a more understandable level for those families so that it makes more sense and that I keep it toned out of the educational jargon and into lay terms and just make it something that’s more…it makes the family more of a team member as a opposed to sitting back like deer in the headlights. Eric: Yeah, so how does the school…so the family shows up and they have the child and they’re having their meeting and there’s someone like you that’s either there in the moment or part of the process and they know you’re part of the process, is that well received by the schools? Laurie: Most of the time. Early on…I work now in private practice in the area that I actually worked as a school psychologist, so early on most of the school psychologists and school staff knew who I was so it was fairly comfortable to go in. I’ve been out of the schools for so long that it’s a whole different staff now. I tend to go in and sit back and try to just listen and not run things. Because it’s not my meeting. And that way I can allow them to do their thing and if the parent’s okay with it, great. That’s where I want it to be. But if the parent has questions, is feeling uncertain or they don’t know what they don’t know and they need someone to fill in those gaps, then I’m there. How Do Families Find Out About You? Eric: And the families, I mean, I would imagine there are a lot of people that could use your services for whatever different reason, but families are maybe unaware that someone like you exists to help them out. We’ve spoken and worked together for a long time so we understand where you would fit in. But families might not know, like we said before they are busy and they have other things going on and they’re certainly trying to help their child out. But it’s like I didn’t even know you existed, Laurie. And how do families go about learning more about this? Certainly, you having the talk about this, you have efforts to put yourself out in front of people on social media or just word of mouth or being in the school districts. How can families go about this? Because they have so much thrown at them when they go to school and they can be lost. The child can be in class and they didn’t even realize that the kid was falling behind. It’s September and the kids passing by, going along, and next thing you know, it’s April, school year is about to end then they find out 3rdgrade didn’t go as well as it should of. What are they supposed to do? Laurie: First, ask questions. Don’t just assume. It didn’t used to be this way, but I have had to get onto the bandwagon. Google. Googling these kind of things. Unfortunately, as far as educational psychologist, my actual license, there are relatively few of us in the state of CA. I don’t know how many across the country. But in the state, it’s a fairly low number in comparison to other things like marriage family therapist and clinical psychologists and within that there’s a much smaller group that’s actually working in private practice. So you’re right, I think there is a certain amount of searching. But ask the questions because there are people out there. And even if you go to theschool, hopefully they know something and they can also help to guide you into a different direction. But yeah. I know. I run into that all the time. That people say I had no idea or they go to someone two towns away and then they come back and talk to me and say I had no idea that you were in my backyard. Man, I’m doing everything I can try to get it out there. Eric: You’re only one person. It’s hard. Do you think the schools have a responsibility to talk about these external resources? Or are they just so inundated with other things that how could they possibly? Laurie: They do to a certain extent. A lot of schools will have a list of people depending on what the issue is. The biggest thing that I see though for people that do testing, I do the therapy and testing piece, most of the time they feel that they can rely on their own assessment, so you know, it’s kind of awkward to be recommending someone outside when they do assessments themselves. That gets a little bit more, I guess a little harder to try to navigate, to try to figure that out. Doctors, a lot of times pediatricians, they know and they’ll make recommendation so you know, speak up to the people that you already know and see if they can give you some direction also, because there’s only certain times that a school will do assessments. A student has to be functioning in one academic area that’s outside of the instructional level of the class room. So it’s not the struggling child, it’s the in one area beginning to fail child. And that’s not always what parents want to wait for. Eric: You said something interesting about how they are doing their own testing inside the schools. So there’s this uneasiness about them saying let’s bring someone in from the outside. Let’s bring an expert in. But you said earlier on, let’s make this about the kid. You have to be humble to say maybe I’m missing something so let’s bring in an expert. That would be no different as saying I don’t think I can help with this but I do know someone that can. And maybe the core issue might not be related to their learning ability. Maybe it’s something else. That you would be, let’s bring in that person. Because going back to your core message, this is about the kid. And it seems like the school needs to realize that. Not everyone, we are speaking generally of course. But that sometimes there is a time to bring in someone because I might be missing something. Laurie: I think in many cases a school psychologist is thinking, well, I have the same training as an educational psychologist. And many educational psychologists actually may have their license as an educational psychologist they just practice within the school. That might be true in one aspect, but the way that I look at testing is much more in depth than what they have time for in the schools. I’m looking for the student who falls through the cracks. I know when I was in the school district, I hated to hear that my student falls through the crack because I thought I would get my backup and hear “no we do look after the…” that’s not true because in the schools we are looking for students that are going to qualify for special education which means they do have to be functioning outside the instructional level of the classroom. Just because they’re struggling doesn’t make them completely outside that level. So they are not going to get tested. Also, a number of years ago I went through having my further training in school neuro psych. So I do assessments with a little bit different bent on understanding the way that the brain works and develops so I have more additional expertise I guess. But the schools have to be concerned about cost liability and those kinds of things and they’re very limited in their resources and their going to be very cautious about how they make those kinds of recommendations. Eric: I think you said it right when you said, how much time do we have? We have five other kids in line we have to get to all of them. We can’t spend hours working on one child. We have to move on and that’s when someone like you comes in. But there are two things I want to touch on. We will start with this one. The way we’re talking, a lot of it is around public school. But you’re working with both public kids and private school kids. Pros and cons? Laurie: Public, private, charter, homeschool, everything. Eric: A lot of the stuff we’ve talked about seems to be about inside the school district, public school, but like you said, you’re seeing all of these kids. Private schools might not necessarily have the psychologist on staff or someone who’s trained in that area. They are more likely, right, to send them off to someone like yourself. Laurie: And I do have private schools in the area that do send parents to me. Laurie: Absolutely. It is a changing market for sure. Eric: So the other thing I see is there are big words being tossed around. In any industry we hear industry jargon and numbers and letters being thrown together. So I’ll throw two out right now and it’s 504s and IEPs. So someone’s saying what’s a 504 and what’s an IEP. Unless you’ve been through it or someone close to you has gone through it, you have no idea what they’re talking about. And it sound like “Oh my goodness what is wrong with my child.” And it’s not that at all. But those words are being tossed around in the school districts all the time. Again, this is you educating the families and kids and people about what all this stuff means and why it can be a benefit. I’m sure you hear that all the time. What’s a 504 and what’s an IEP? Laurie: An IEP is under your special education right. It has to do with kids that have a learning disability. Or it could be a delay on the autism spectrum or an emotional delay or emotional disturbance that’s happening. It could be a physical problem that’s keeping a child from being able to learn, it could have to do with blindness or deafness or hard of hearing or limited vision. All these different levels of disabilities or what I actually prefer these days is more of the different abilities because that’s really what it is. So a special education document is what an Individual Education Plan is or an IEP. And It’s supposed to be written up with goals that are directly related to the needs of that child. So that even if they’re in a general education classroom and they have support in language speech or occupational therapy, or physical therapy or adaptive PE or resource specialist support, that they have a specific thing they’re working on. Usually they have more than one goal or it could a student who is in a special education classroom and they have goals in every area so that they have very specific things that they’re working on with ways that are meaningful to that child in presenting that curriculum. That’s the whole idea of the IEP. The 504 is different in that it is not under the umbrella of special education. It’s under the umbrella of our civil rights, it is not education specific. The civil rights that we all have to have equal access so that they individual who needs an elevator to get up the stairs or ramp. Or various other things in order to be able to access whatever it happens to be. In the school settings, it’s a plan for the special education teacher to follow, saying that the student needs extra time to complete a test. Maybe they need a quiet environment. Maybe they always need to be in the front of the class or they need someone to take notes because they cannot keep up with note taking. Something like that. They can still benefit from the curriculum in the general education classroom, but they can’t keep up if they don’t have something tweaked a little bit. That’s called an accommodation. Not a modification. That’s completely different. A modification is when you’re changing something that messes up grading and stuff like that. Accommodation just means you are tweaking it a little bit to meet the learning style or learning needs of that child. Eric: You talking about this is comforting as I have three kids, but if I were a parent of any kid it’s important to know that there’s people out there, that you have this understanding and ease of explaining it to me and the ease of the listeners. That’s why we love talking to people like yourself. Because you’re helping your clients but your helping just the market that’s out there. And people need to understand these things. Which goes to the point of marketing. And getting your voice heard and getting out there because you truly have something to share. And it’s not about, it is, yes you need clients and you need to stay in business, but at the same time you’re trying to help the market. And if you could post that little snippet, that little video about what is an IEP and what is a 504, and say that went on Instagram a family saw it. They might not even live in the same area as you but hearing that might help them out. It might give them more understanding. So you’re on marketing and social media. You spend a lot of time putting this together. For the benefit of other people, do you have a favorite part of what you’re doing with your marketing efforts? Is it social media is writing articles, is it just getting it out there and talking about what you really care about, like coffee? What is your favorite part about marketing as you run your business? Laurie: It certainly has transformed over the 20 plus years that I’ve been in private practice but in this current time the thing that I find most rewarding, I like that I get comments so I know that people are seeing it and it’s helping them and causing them to think. It’s those little things that are being put on social media. As well as blogs that are part of the same avenue. It’s nice to see that it’s able to reach people and maybe somebody that’s just beginning to see a struggle in their child or a struggle in themselves, they begin to process and go, “Really? That kind of sounds like me or little Johnny. And maybe I should be doing something about this. I haven’t thought about that before. Maybe that would make a difference in this area where we are struggling.” That’s what I like. It’s just those little bits about getting out and touching people. Eric: I would totally agree with you. Sometimes it’s not that obvious return that you might get from posting an article and someone calls you up and want to be your client. When you’re grateful that you can share something with someone else and they are grateful and they leave you a comment, or you just know people are taking something from it goes a long way and it keeps you going, just hearing your voice and obviously you said a bit, it matters. It’s very genuine and it’s important. And you also just brought up another point. It might impact the adult or business professional. We’ve talked a lot about kids and how it affects them at schools. But you work with adults and business professionals and they have a hard time keeping up and they’ve gone undiagnosed for so many years and didn’t realize that there’s something going on that I could use help with, right? Laurie: In talking about that 504 which is the civil rights, that’s not age specific. So if you have someone with ADHD in a work environment who is a great employee but maybe they’re very disorganized thy may need an accommodation to help get them in a more organized or systematic fashion so they can get their job done in a timely manner and maintain that ability to continue to perform within that company. Or there’s often times adults coming in, maybe sometimes, even they’re child has been identified and they’re saying they have an attention issue or a learning issue that’s impacting them and they want to take a look at why and what do I need to do about it because I’ve been struggling or putting extra tie in or I’ve been avoiding this when I didn’t need to. As well as adults that are returning to school because they dropped out and decided not to finish college because it was so difficult for them, and now they want to pursue it in their 30s and 40s. So more and more I am seeing adults being more mindful that these are possibilities for them in looking for help. Eric: I think the combination of this of adults being more mindful about this and it becoming more the norm to be open and talking about this and then having something like you at the same moment, you share a piece of information that talks about this. That they are not alone in this. There are business pros out there that aren’t keeping up as they should. They certainly have the capabilities they should just rewire it or however they need to do it, have some help from someone like you that can get them to then, “Oh, I can take the next level.” It’s those people that are putting the extra effort. I remember being in school and I went to a school that had a sort of way of teaching and I didn’t always take to that certain way. It wasn’t until my parents got me some help outside of school that I started to realize that I needed to think about it and learn it in a different way. I needed to see it, hear it and reteach it to myself. It wasn’t until my junior year that I started seeing that and then it picked up, and then college and post college and going into my career. That I saw that there’s different ways but you needed outside help. So I’m a person here that truly believes in this. I’ve done this with my own kids. It’s important for people to realize that this exists out there. There’s a lot of people going through it and it’s amazing what it can do for you if you allow someone like yourself to come into their lives and help them out. Because it’s so important. We spend so much time training our brain, learning trying new things and if you struggle with it, it’s easy to say I can’t do it and just shut it off. Which can lead to many things. I’m sure you have seen this over the course of many years. So I appreciate first of all what people in your profession do, and I think it’s much needed and I think there needs to be more conversation out there about it. That’s why we love talking to you about this stuff and having you on our podcast to talk to you about it. So thank you very much for doing that. If you weren’t an educational psychologist, what would be your career of choice? Eric: What I want to do is go on to a little quick question answer with you. If that’s okay. Then we will go on to how to get a hold of you and say goodbye. If you were not an educational psychologist what would you be doing? Laurie: Oh goodness. That is such a hard one. It really is. I think that my…I probably would have landed in teaching. I was interested in teaching to begin with and really I decided not to do it because I didn’t think I was very good at managing an entire classroom. I much prefer to go into a classroom now, look at what’s going on and give a teacher ideas. But there was a time for a long period, I thought I’d be a great kindergarten teacher but at some point but at some point I decided I probably didn’t have those behavior management skills. Eric: It’s self-awareness right. To realize what you’re good at, working one-on-one. Any time we’ve talked on entrepreneur. It’s all related. The profession that someone else would pick is in, a way, closely related. It goes back to your core message, it’s about the kids. So if you’re helping kids, it sounds like your happy. And if your helping business professionals and individuals benefiting themselves, I think you’re feeling pretty good about yourself. Eric: We talked about coffee. You live in an incredible area in Southern California. I’m sure you’ve gotten out. You like to travel as well. Do you have a favorite place that you like to travel to? Laurie: I would say, not necessarily not travel to like on a regular basis, but probably the one the one that I enjoyed and that kind of sits in my head, Italy. 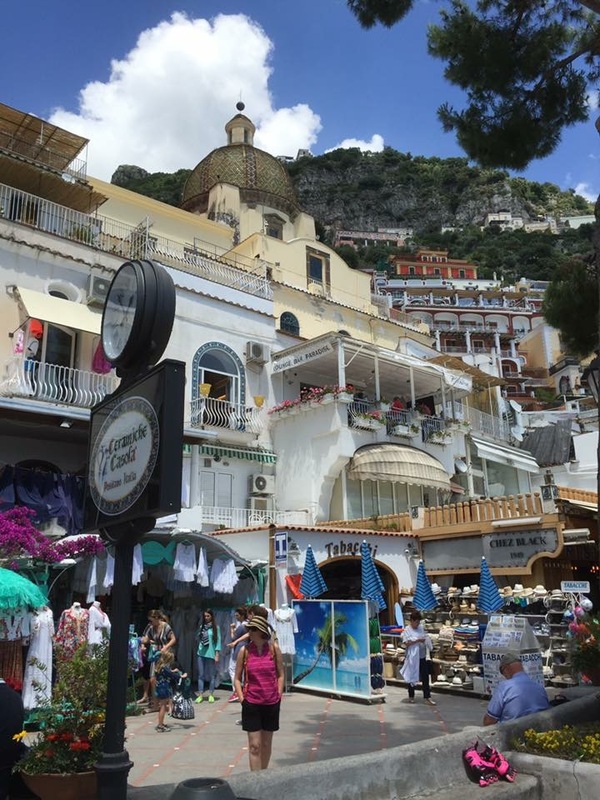 When I went to Positano. Just overlooking the cliffs and ocean is pretty amazing. Then right along with that same trip was Paris, just loved Paris and would love to come back. Eric: Pretty good coffee over there, right? Laurie: Oh my goodness, yes. Unfortunately, the food is incredibly good too. So that did me in. Now, closer in terms of our own country, in the United States, I would go back to New York in a heartbeat. I loved that city, I would go back there in a heartbeat. Eric: Is it just the vibe, and the energy you get from the city and just all the different things you can do. Laurie: I think it’s the visual. It’s a place that is, first of all, I was fearful of New York when I was a kid. It’s a big city, it’s dirty. All this stuff. It was beautiful, I loved it. It had so much going on People moving, going and just…I don’t know. The vibe, I guess, is what I would say. There is so much to see and I have only barely scratched the surface. When Did You Get Serious About Owning a Business? Eric: I just love how you have this…you see the good in everything. That’s what I see. You see this child who might be developmentally delayed, and you see New York City and you find the best thing that you possibly can and you take to it. That’s amazing. We need more of that. When was the moment you told yourself that you needed to make it happen and you told yourself no excuses? Laurie: I guess the way I’m interpreting that question would be, or what comes to my mind, about a year ago, I decided I need to move to that next level of making my business explode. It’s always been a just kind of here and working along and serving people. But kind of seeing it at a lower level. About a year ago, I just decided it was time to make it now as more than just a little private practice but make it more like a business. Which is not in my wheel house. I came out as a service provider and not as a business person. That year I decided, okay I was ready to bite the bullet and I needed to do the marketing and really try to reach those people, even in my community and the communities that are moving out from there. And let them know that this is out there and available because there are just too many people who don’t know. Eric: I think you hit it perfectly. We all make decisions as entrepreneurs, as business leaders. We say, “What do I have to do? I need to take this to the next level.” You recognize that and then you act on it. There are a lot of people talking and once you realize you have something amazing to share with people, they just have to know about it. Like I said earlier on, people need to know that you exist and you are there to help. I appreciate the time that you’ve given us. I know a lot of our listeners would love to hear this and will hear this. What is the best way that someone can get a hold of you? Laurie: Well obviously, by phone is an easy way. I will always talk with a person and spend some time with them on the phone in order to determine what their need is and to get them to the right place. That is 661-255-2688 or for those people, especially the Millennials, that really want to do everything through the computer, my website, laurieadachi.com, and then you can email me straight through there. So any of those ways works for me. I am more than happy to answer their questions or talk with people. Eric: I think we talked about this before. Doing a phone consultation is important. Sometimes people might be intimidated, and they don’t want to come in right away. But they want to have that phone consultation. We can just talk on the phone and see if this is a fit and see if you’re the person and I’m the person on the other end that would work well together. Laurie: And I don’t have a receptionist. I have me. Either I will pick up the phone or I will be returning the call. So don’t hesitate. I have no problem talking with people. If I’m not the right person, I can direct them to other people. Or sometimes I just direct people back into the school to find out what they need to do in order to get a process going. Eric: Well, I think that’s fantastic. Thank you for your time. We appreciate it and we will talk again soon. Laurie: Okay, thank you Eric.